Blessed are the monster makers. It can’t be easy to create a new monster in this day and age. Science fiction and fantasy stories, novels, movies, television shows, comics, and videogames have given us thousands of new monsters over the last century. Where once there were only ghosts, vampires, werewolves, and demons, now there are monsters of every conceivable size, shape, color, toothiness, and alignment. 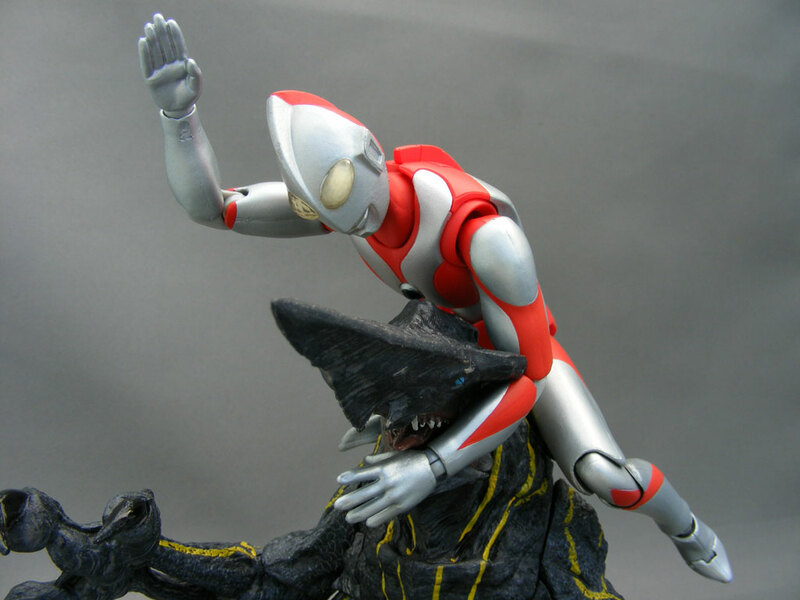 Heck, Japan’s Ultraman and its myriad spinoffs give viewers a new monster in every single episode (with sometimes hilariously goofy results). So Guillermo Del Toro and his design team on Pacific Rim had their hands full creating new kaiju (Japanese for “monster”) to threaten humanity. Perhaps inevitably, some of them ended up resembling existing monsters from pop culture history. In some cases this may be coincidence, in other cases deliberate homage, and in a few cases, parallel evolution. 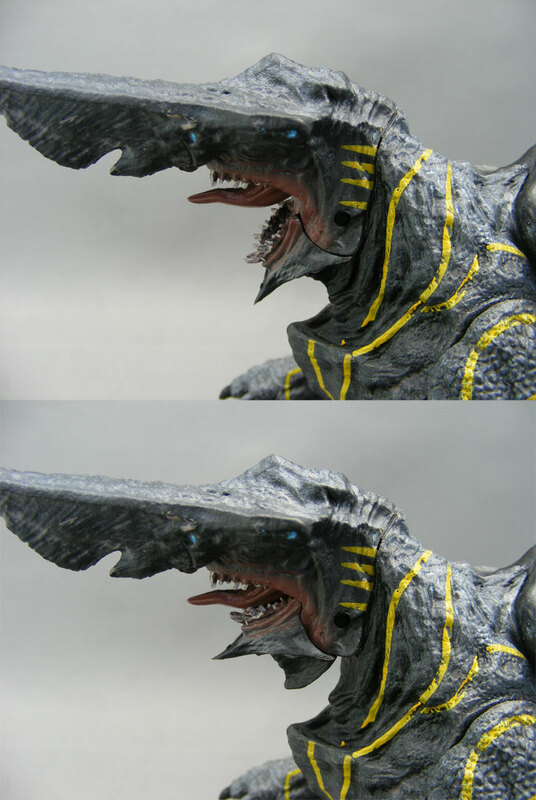 My hunch is that’s what happened with Knifehead. 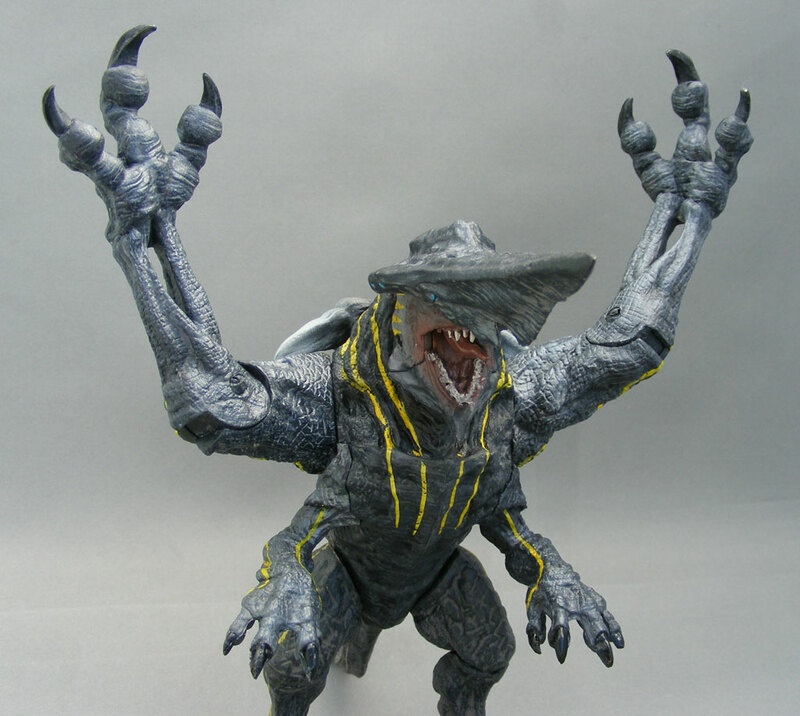 He bears more than a passing resemblance to a pair of vintage Gamera foes, Zigra and Guiron. The former was based loosely on the goblin shark,* while the latter has, well, a knife for a head. Del Toro describes Knifehead this way: “It’s like if you took a shark and you pulled its nose way out until its head become this very sharp, pointy, blade-like shape rather than the blunt triangle that a shark normally is.”** So Knifehead is like a shark whose nose got turned into a knife. I don’t know, he still looks an awful lot like a goblin shark to me. 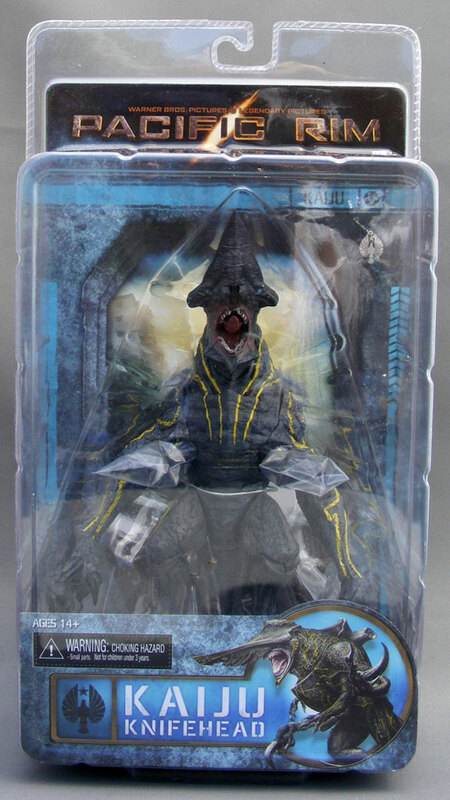 Packaging: The figure comes in NECA’s usual clamshell packaging. The cross-sell graphics on the back are photos of the figures themselves, which I find a bit disappointing these days – I prefer to get pics from the movie, or maybe some art. The front insert features Wayne Barlowe‘s beautiful concept art of Knifehead. It’s interesting NECA used it, since it doesn’t match the final design in the film (but the same is true of Crimson Typhoon’s insert art). Design & Sculpt: These figures were produced from digital 3D files provided by the production company, which were then touched up by NECA. The results were disappointing with Gipsy Danger – that figure is lacking in details. That doesn’t seem to be as much of an issue with Knifehead. He has a lot of texturing on his flesh, though it varies considerably; his legs are pebbled, his sides have cross-hatched scales, his arms are rough and pebbled, his tail and the top of his head are smooth, and the underside of his “knife” has slanted, parallel lines. I have no idea if all these textures are accurate to the monster itself – I’d need a really good photo of a production maquette, or at least an excellent screen capture from the film, to be certain. But for the most part, the sculpting on the main part of the body is sharp – literally. That knife-head is downright pointy, and the edge beneath it, while not paper-cut inducing, is also quite sheer. However, the big, flat “dorsal fin” on his back has a much softer sculpt that doesn’t blend well with the rest of the body. It’s like a big remora just laying there. There’s a chance this is intentional – it could be some kind of organ on its back that has a smoother texture. But it’s definitely incongruous with the rest of the figure. 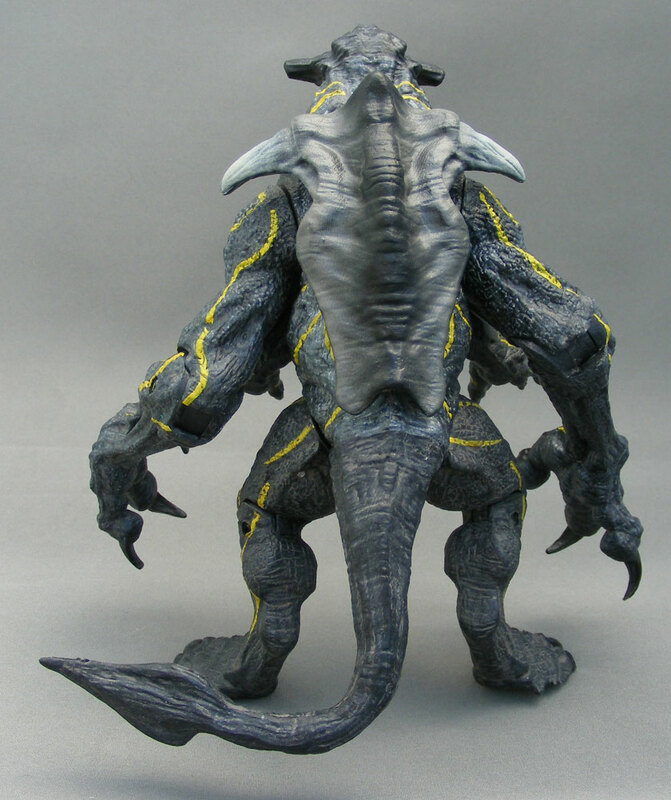 Some of the Kaiju are so huge they become cost prohibitive for us to produce at scale so we tried to work with Kaiju that would be close to our target pricing. The Leatherback in Series 2 is enormous, huge and heavy chunk of plastic. Unfortunately, it appears Knifehead was still too large to do properly in-scale, since Gipsy Danger inaccurately towers over him. 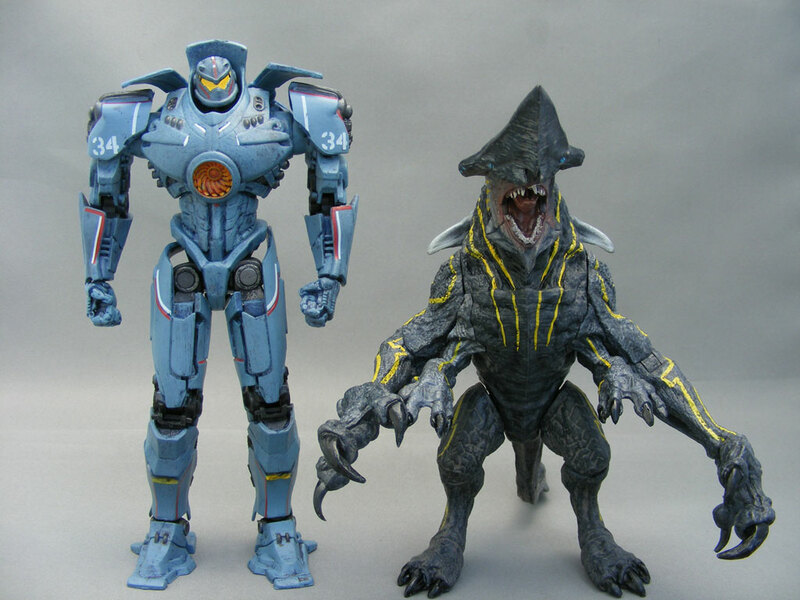 What puzzles me is NECA could easily have just made the Jaegers a bit smaller – say 6″ instead of their standard 7″ scale – and not only could they have saved money on production, but Knifehead would be closer to proper scale (though I think he’d still be a bit small). 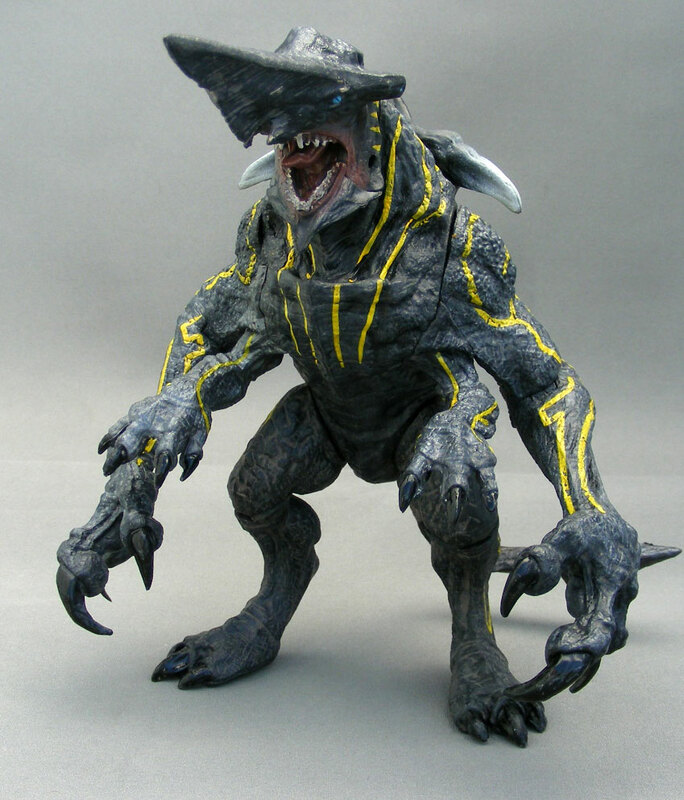 The twist is that, by being smaller, Knifehead is in near-perfect scale with S.H.MonsterArts. 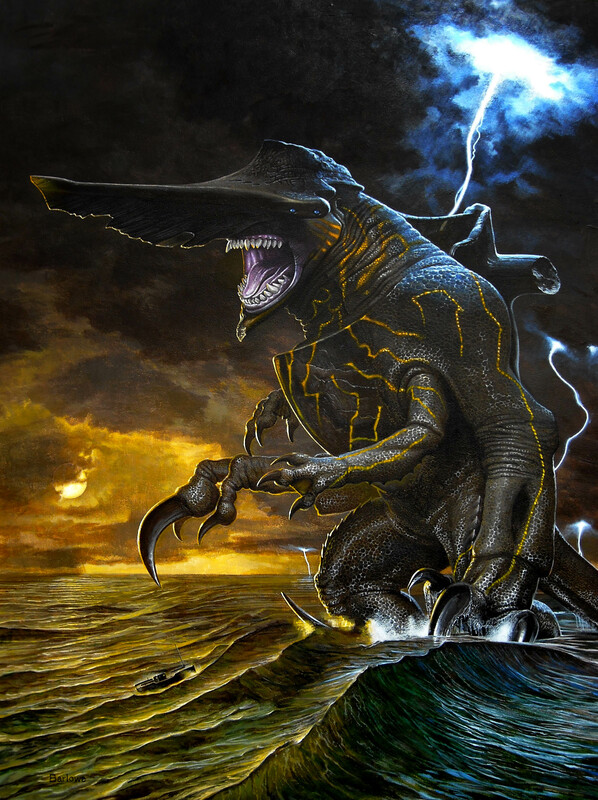 The Godzilla in the pics is supposed to be 100 meters tall – exactly the same as Knifehead. 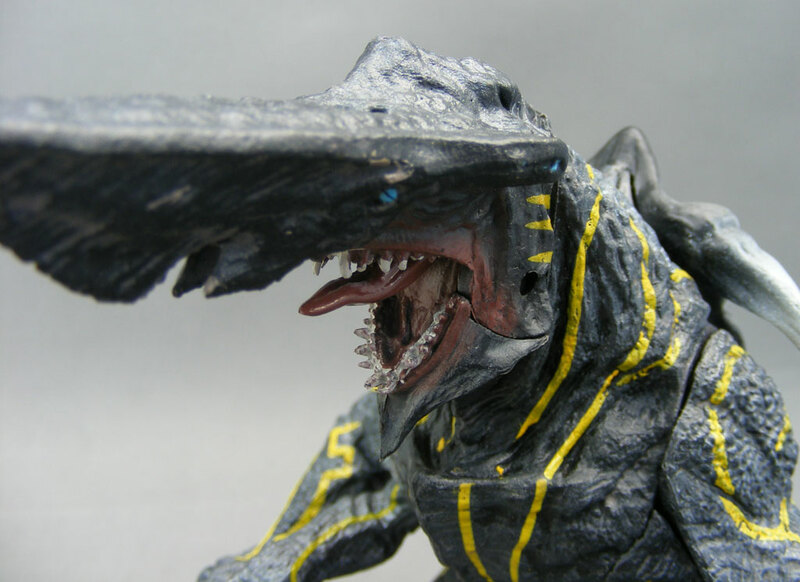 Plastic & Paint: Knifehead is molded in black plastic. There’s a kind of sheen or shiny speckling to the figure. I’m not sure whether this is a paint application or something that was mixed in with the plastic, and I’m also not sure if it’s supposed to represent some sort of otherworldy nature to the monster’s flesh or if it’s just supposed to look wet – but I think it works. The most significant paint applications are the yellow, almost tribal-looking stripes, the horns on its “dorsal” part, the black glossy nails, and the red mouth, white teeth and multiple blue eyes. The yellow lines are pretty well delineated and don’t look sloppy like the white details on Gipsy Danger. There’s a good wash on the limbs that give it a slightly dusty, dinosaurian look. The paint applications on the mouth and teeth, however, are sloppy. It’s not clear where the mouth starts. 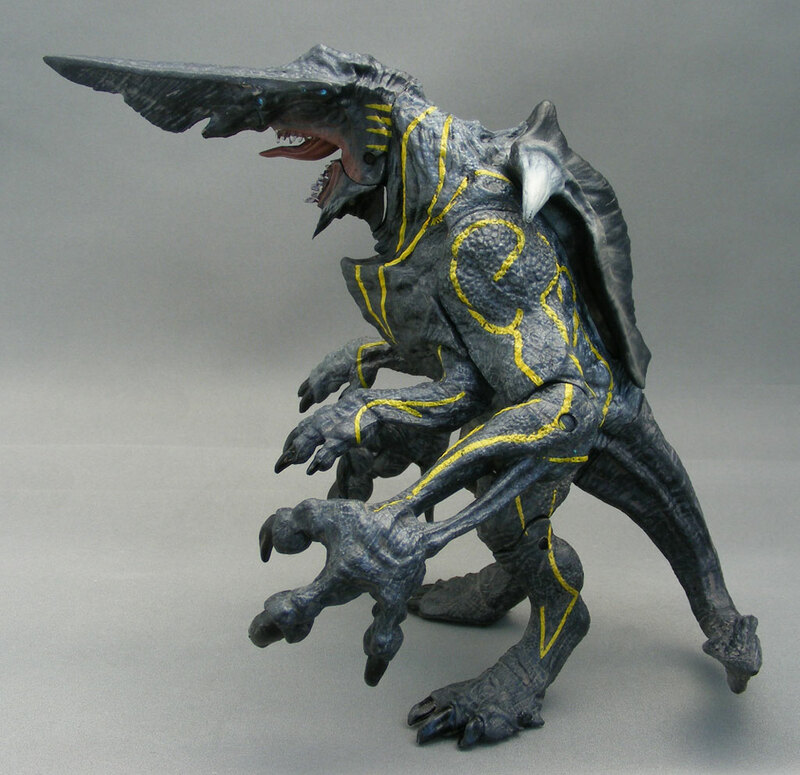 Articulation: Knifehead has a swivel jaw, swivel shoulders, hinged elbows, ball-jointed hips, hinged knees, and and a bendy tail. The inner two arms are not articulated. It’s just not enough articulation. I can accept the lack of head movement – Knifehead has an extremely thick neck, and I could believe it can barely move its neck. The hinged jaw and bendy tail are nice touches, though it should be noted that the “ball joints” of the hips are so restricted as to basically be a V-crotch, rendering the hinged knees useless. But this figure really needed at least ball-jointed shoulders. I understand why they’re not there – NECA is being cautious with this line, and I’m sure the ball joints were simply too expensive – but their lack makes this figure this close to a McFarlane statue. Accessories: None. Which is a bummer – couldn’t we get some little tanks or ships or jets or something? A cargo container? Something to smash? Quality Control: This guy’s solid. I suppose if you dropped him nose-first the knife might break off, but on the other hand, maybe not. Overall: I really want to like these figures, but NECA simply didn’t put the money and effort into them that they have some of their other lines lately. 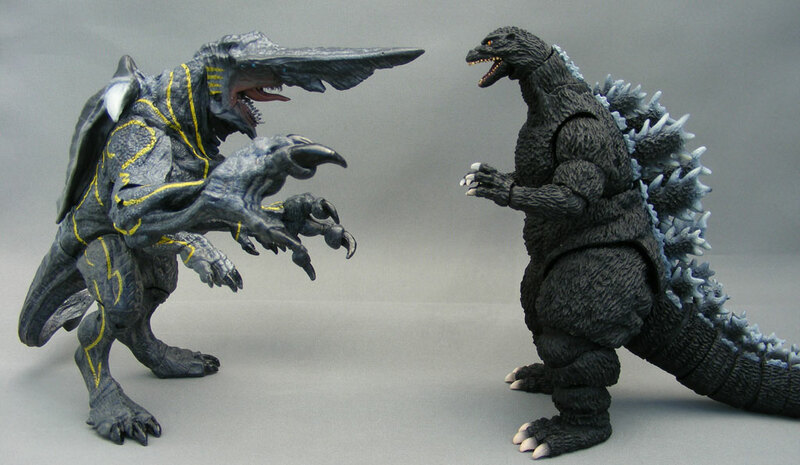 It’s funny; five or six years ago, I’m not sure collectors would have been as disappointed by these because it’s what they would have expected from NECA. They’re victims of their own success with this line. Knifehead has a great sculpt, but the scale and articulation issues really weigh him down. Ball jointed shoulders alone would have added a raven. Still, for the nascent Pacific Rim superfan like myself, he’s hard to leave on the peg. * Fun fact: my submission for the MOTUC Create-a-Character Contest was also based on the goblin shark. I’d really love to show it off here, since Mecha-Shiva’s art was awesome, but Mattel won’t let me. ** Cohen, David. Pacific Rim: Man, Machines, and Monsters. 1st ed. San Rafael: Insight Editions, 2013. 134. Print. if he can look up in the movie…. Knife head reminds me most of Hock from Duperhjma Samurai Syber Squad…. Okay, Bagira from Gridman. But yeah. The figure is disappointing, though I don’t regret owning one. My iPhone’s autocorrect really fails me sometimes. Great review! I think birdon is amazing AND hilarious, which is the true test of a kaiju! The scale doesn’t bother me because what if this is just a smaller type or a youngster? Anyways, I’m not sold on this line either. I like them, but $50 like? Hmmmm, not sure. I believe Wayne Barlowe (of Power Lords / Avatar / Hellboy / Harry Potter fame) designed this guy. I know he worked on Pacific Rim and that's why I bought this guy so he can terrorized the Four Horsemen's new Power Lords when they come out.